Before I blog about the final of the Nutriplus Pastry Competition, I shall contribute a recipe as it’s been a while. Thank you all so much for your lovely messages on the last post, it’s very heartening to see as some of you I haven’t even met in real life. I love how food brings us all together. Well, sentimental aside…… Today I’ll talk about something very fundamentally Malaysian, which is none other than the Nasi Lemak. Nasi Lemak is undoubtedly the national dish of Malaysia. Lemak, literally means ‘fatty’ in Malay refers to the rich and creamy rice cooked in coconut cream/milk. There are many regional variations of this dish and it’s safe to say that everyone has their own preferences. At the very basic Nasi Lemak consists of rice, sambal, “ikan bilis” (anchovies), roasted peanuts and half a hard-boiled egg. You can still get packs of these wrapped in banana leaves (or newspapers) for nothing more than RM2 in some places. Many have that for breakfast (especially Malays), but it’s also suitable for lunch or dinner and that’s when we have more substantial options available. The most common ‘upgrade’ includes a piece of fried chicken. Others include Cuttlefish sambal, Beef Rendang, different Types of Curries etc. Although this has been the national favourite for many years, it has unfortunately been said to be contributing to obesity especially in school children. Some time last year in Ipoh, the Ministry of Health had even wanted to take Nasi Lemak off School Canteen’s offerings, which was met with great resistance. True, there are quite a few sinful components in this dish, and the purists would probably scowl at me for changing the traditional recipe. 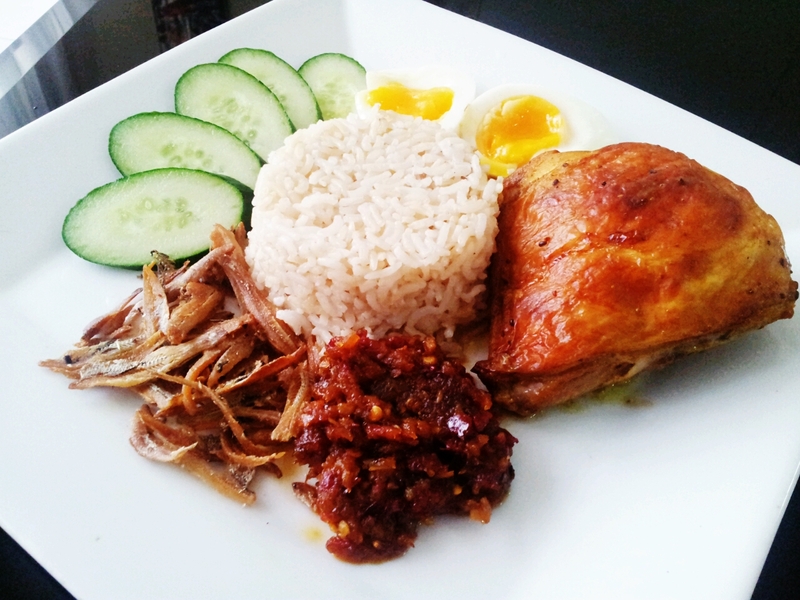 But here I am, presenting you with a healthier version of Nasi Lemak. Relatively Guilt Free Nasi Lemak, but still equally delicious! I do love the traditional nasi lemak but most tend to be a bit on the greasy side, especially when you have the fried chicken in the equation. Which is why I’ve decreased the total amount of oil used for this dish. I baked the chicken instead of frying them, and let the fat rendered in the oven. 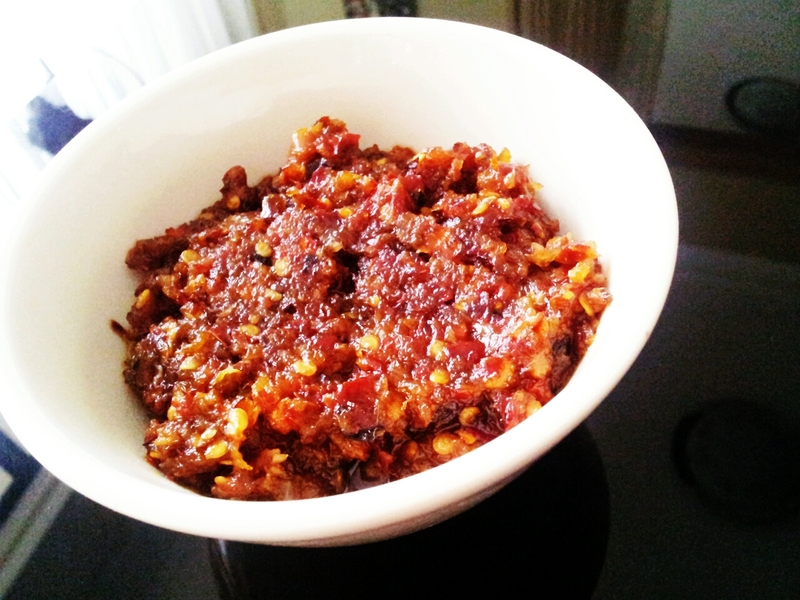 The oil used in sambal was also kept to minimal. And instead of deep frying the Ikan Bilis (anchovies), I’ve pretty much dry fried them with only a tiny amount of oil. In the rice department, I’ve used Brown Rice of course for high fibre content and lower GI Index. I’ve adjusted the ratio of the coconut milk too. For personal preference (and health reasons) I’ve omitted Belacan for the Sambal (so it’s also vegetarian and suitable for Frank). You might have noticed that the roast peanuts aren’t on the plate, that’s because A. I don’t like peanuts, B. I couldn’t find them in the supermarket that day anyway. Peanut gives me sore throat. Hardboiled eggs are boring and make less exciting photos. You know my preference already, the runny yolk is a must. Rinse the brown rice and add everything in a pot. Soak it for 5-10 minutes then cook until rice is fluffy. Of course, you can do this with Rice cooker. I don’t have one! Doesn’t make me any less Chinese. 😛 Let cool a little before serving. Mix everything in a bag and marinate at least 2-3 hours, best to leave overnight in the fridge. When ready to cook, preheat oven to 180C and bake for 30-40 minutes until skin is golden brown. You’ll find plenty of oil pooled around the roasting tray. Discard. Blend the above ingredients with a blender until pretty fine. Heat about 3 tablespoons of oil, and first fry the chili paste until separate with oil. Add tamarind and sugar, continue to cook for another 15 minutes or so until the mixture turns dark red. Add a little water at this point and cook for a further minute or two. Taste, and adjust if needed. Let cool. Store the unused portion in fridge for up to 1 week or so. Arrange everything neatly on the plate, and enjoy your meal, whatever time it is! A very satisfying lunch, and for me, an extra portion for dinner! The addition of yoghurt tenderised the chicken while keeping it moist. I love the complexity of the taste brought by the spices, the rice was suitably fragrant and fluffy, the sambal maintained a good balance of sweetness, tartness and just enough spice to warm my tummy up. The runny yolk provided the velvety mouth feel which is heavenly with the sambal. Texture wise, we have the Crispy Ikan Bilis and Cucumber to add the contrast. Best thing is, I did not feel that the meal was too heavy. Perfect. So how do you like your Nasi Lemak? Yummy and healthy! I am keen to try out with quinoa! It would be lovely with Quinoa, as it should cook well with Coconut milk too. I like the rice soft, not soggy…and very very fragrant, very lemak with the rich santan/coconut milk taste. Most around here…dry, hard, hardly any santan fragrance at all – quite disappointing. Don’t think I love it enough to want to cook my own though. Me, lazy!!! LOL!!! Baking the chicken and using runny egg is such a good idea! Hahaha I wouldn’t go as far as 2 servings at once but I did have the same thing for dinner again…… and still delicious! Wow! looks incredible. Leaves nice aroma in kitchen too. Hehe you should be more adventurous and try this! Nice! Geez school canteens served this??? Beats the garbage in the Australian school system hands down!! Yes! And laksa, fried rice vermicelli, banana fritters etcetc all sorts of exciting things! Nasi Lemak always reminds me of being on holiday and having breakfast. It sounds like heaven Kelly! mygod! looks delicious! reminded me time for breakfast! I saw yours too, looks fabulous! I think the fact that we are making it at home already means it’s going to be healthier, plus we are very aware of what we put in our food. 😀 Thank you!! Yes baking is my favourite way of cooking chicken! Good idea of creating a healthy version of this traditional dish. Love it. What a gorgeous plate of deliciousness! 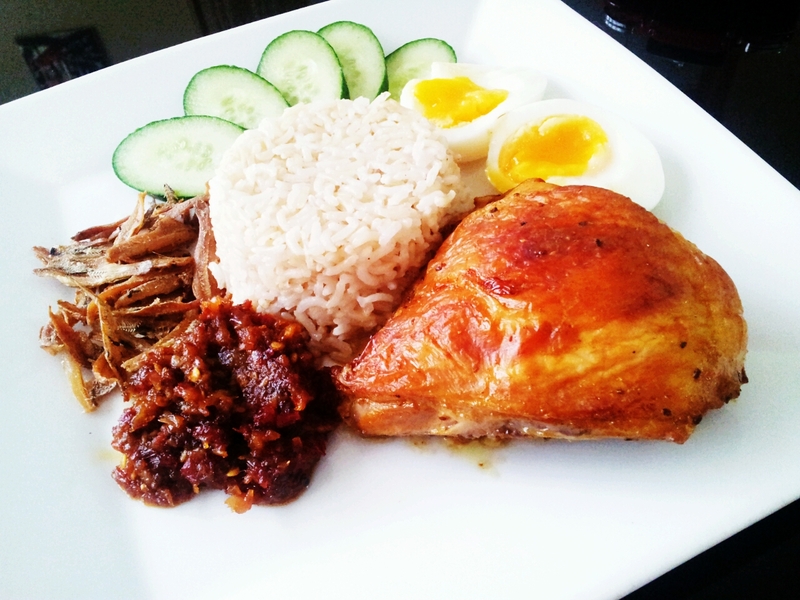 Love your healthy version of nasi lemak..I also need to start practice cook more healthy dishes for my family. Love your healthy version Nasi Lemak. Looks very appetizing. A small tip for crispy and oil free ikan bilis. Rinse ikan bilis with water and drain. Arrange a single layer of ikan bills on a microwave proof plate. Baked it in a mircowave oven at 100p(high power level) for 3 minutes. Check with a spoon to see if it is complete dry and crispy but be careful as it is very hot. If it is not done yet just add another 30-40 seconds. Hope this does help to have some oil free crispy ikan bilis. That’s a good tip! I think I should be able to bake it too, though I didn’t give it too much thought when I cooked it. Awesome let me know if you like this! 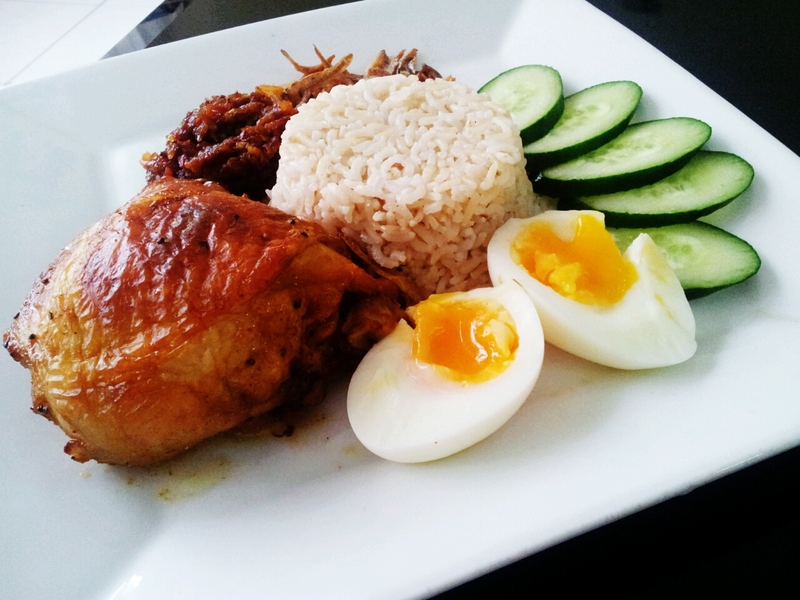 Your idea in making the nasi lemak healthy is really good !! thanks you for sharing. Hi, Kelly. I found recipe by accident on internet cause i had this dish on airplain long time ago and i quit like it. So i will try to use your recipe to night. By the way i am thai and i like all asian food, i love cooking all asian food (only well known dish) and also Europian food. Taan from thailand. I cooked the rice according to your recipe and it tasted like rocks. I’m assuming the mistake was that it should state 2 cups of water not 1 cup?